Great support at NASUWT teachers’ trade union conference in Birmingham this weekend. 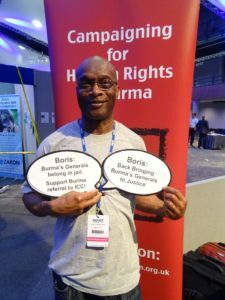 Delegates supporting our campaign to bring Burma’s generals to justice call for Boris Johnson to back Burma’s referral to the International Criminal Court. Karen News reports on the open letter from 21 civil society organisations urging the EU to take a stronger stand on the Rohingya crisis. Rohingya in Bangladesh haven’t been consulted about the deal, but most say they don’t want to return until it’s safe. The agreement between Burma and Bangladesh to repatriate Rohingya refugees is like expecting 1940s Jews to return to Nazi Germany, says Sky News. On his visit the pope appealed to Burma’s leading Buddhist monks to combat prejudice and intolerance, but left out any specific reference to the Rohingya. Papal advisers counseled the Pope not to speak about the Rohingya on his visit for fear of a backlash against the 650,000 Catholics in Burma, reports the Voice of America. CNN reports that after meeting Pope Francis during his visit to Burma, Senior General Min Aung Hlaing said all faiths in the country are able to worship freely. Mark Farmaner, director of Burma Campaign UK, is quoted: “Min Aung Hlaing is the biggest obstacle to improving human rights, democratic reform, peace, modernization, and improving health and education in Burma.” While the Pope has spoken out in support of the Rohingya in the past, says CNN, it remains to be seen how much he will press the matter while in Myanmar. Pope Francis visits Burma and Bangladesh next week amid international outrage over what the US describes as the ethnic cleansing of the Rohingya Muslim minority, reports the Voice of America. 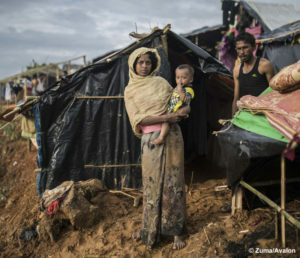 Mark Farmaner, director of Burma Campaign UK, criticised the deal between Burma and Bangladesh to repatriate Rohingya refugees who have filled out their personal details on forms. He described the deal as a way of “buying time”, since sluggish bureaucracy in both countries means that it could take years to cross-check refugees’ identities. Commenting on The Irrawaddy’s reporting on the Rohingya crisis, New York’s Daily Beast says the Yangon-based paper, which receives funding from USAID, has parroted Burmese government propaganda. “Decades of hard work building the reputation of The Irrawaddy has been undermined by the editor in chief deciding to abandon journalistic independence and come down on the side of racists saying the Rohingya don’t belong in Burma,” said Mark Farmaner, director of Burma Campaign UK.